3 months have passed since we released our Bearish Apple Alert, and it couldn’t have been more prophetic. 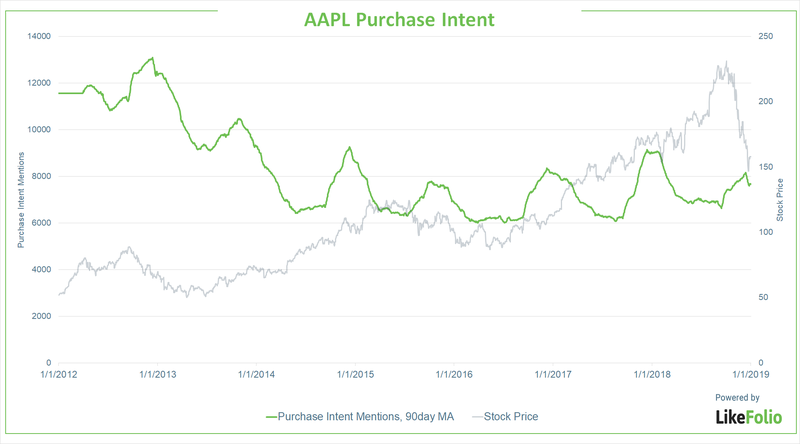 An unusually low volume of Purchase Intent Mentions in the days following Apple’s 2018 keynote address tipped us off; AAPL shares have plunged more than $75/share since then. The scale and speed of Apple’s reckoning have (happily) surprised us, but the current trend cannot continue ad infinitum. We’re officially calling off our bearish AAPL position. Aside from the fact that it’s already outperformed all expectations, the data no longer reflects the continued selling taking place. Although Apple Purchase Intent (PI) Mentions for the 2018 holiday season pale in comparison to the previous 2 years, they still show reasons for optimism going forward. Compare the current level of the AAPL PI 90d Moving Average (far right on the chart below) to the level seen around this time in early 2016. Following a disappointing reception to the 2015 keynote address, Apple Purchase Intent decreased throughout the entirety of the 2015 Christmas season. The palpable loss of consumer interest translated to 9 months of stagnation for the stock in the next year (they wouldn’t fully recover until 2017). We noted a similar PI weakness in the days after the 2018 keynote address, but unlike 2015, consumer apathy hasn’t extended into the current year. This suggests that the 30% drop in Apple’s valuation has been an overreaction to lower-than-expected Q1 numbers, rather than a sign of the company’s impending decline. While the data doesn’t point to a major bullish reversal of the prevailing trend (yet), it does demonstrate that Apple still has gas in the tank. We recommend a cautiously bullish outlook: buying the dips over time and selling puts underneath the market. At the current discount price, it’s a good bet to accumulate a few shares of AAPL, and any premium gains will be icing on the cake. In closing, Apple still may have some tribulations ahead, but the company that a 1 trillion dollar valuation last year isn’t going to fade into obscurity. You received this email because you are subscribed to Member Alerts & Emails from LikeFolio.